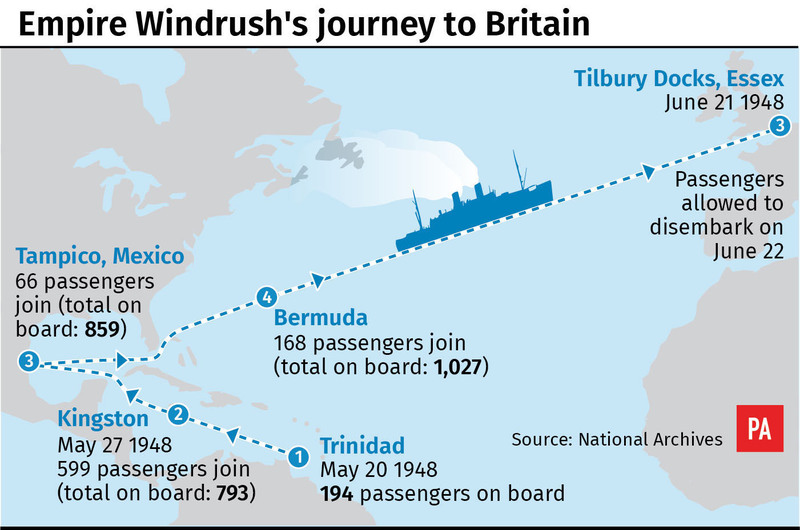 The people of the Windrush generation showed resilience as they helped rebuild post-war Britain, often in the face of adversity, a service to commemorate the 70th anniversary of their arrival has been told. Prime Minister Theresa May, whose Government has been heavily criticised amid a scandal that has seen people who were invited here decades ago face deportation, was among those listening at a service in Westminster Abbey. The Rev Canon Joel Edwards, addressing a congregation including members of the Windrush generation and their descendants, hailed the positive impact those who landed at Tilbury Docks on June 22 1948 and their offspring have had in the worlds of politics, business, music and food. He said the Windrush generation had "gifted Britain", providing trade union leaders, politicians and senior civil servants, as well as becoming leaders in various other areas of British life. But many of those who left sunnier climes in the Caribbean for a new life in Britain faced hardships including racism, Mr Edwards said, as he paid tribute to "Windrush resilience". He said: "Settling down hasn't been plain sailing. The children of Windrush have experienced over-representation in Britain's prisons and mental health institutions. Knife crimes. "Underachievement in education and the job market. Settlement has meant racism, sometimes too much policing and not enough protection. And Stephen Lawrence." The murdered black teenager's mother Doreen, now Baroness Lawrence, was in attendance alongside Liberal Democrat peer and patron of the Windrush Foundation Baroness Floella Benjamin, who briefly danced to music being played on steel drums in the nave ahead of the service. Lady Benjamin said she felt "joy", adding: "I was floating, like a bird, free." The service, also attended by Home Secretary Sajid Javid, Mayor of London Sadiq Khan and shadow home secretary Diane Abbott, was peppered with short pieces of drama. Actors recounted the story of those who left their native islands to make the long journey to Britain, showing both the joys and hardships faced by immigrants. Mrs May clapped, smiled and swayed as a gospel choir, wearing the red, green and yellow of the Caribbean, sang. The service included the first performance of a specially composed anthem entitled Psalm To Windrush: For The Brave And Ingenious, and celebrant the Very Rev Dr John Hall, Dean of Westminster, wore a robe featuring a photo montage of aspects of black history in Britain since the arrival of Windrush seven decades ago. John Richards, 92, who came to Britain on the Windrush aged 21, described the service as "great". Asked if he found it emotional, he said: "It brings back memories yes, but I'm too old for the emotion." The celebrations come as the fallout continues from the deportation scandal, which also saw some denied access to the NHS, work and housing despite having a legal right to be in the UK. The Government effort to right the wrongs of the fiasco continued this week with a Home Office announcement that former chief crown prosecutor Wendy Williams will oversee the Windrush lessons learned review. Plans to create an annual Government-backed Windrush Day have been welcomed, but questions remain over compensation for those who have suffered financial setbacks trying to prove their right to residence. The Home Office has reiterated Mr Javid's commitment to a compensation scheme and said more than 500 people and organisations have come forward as part of the call for evidence. More than 2,000 people have been provided documentation since April by the dedicated Windrush task force, the Home Office said, helping them to demonstrate their right to residence. Under the new Windrush scheme, which offers free citizenship for Commonwealth citizens who arrived before 1973 and children who joined their parents before they turned 18, some 285 people have so far been granted citizenship, they added. So far the Home Office has made contact with 11 people who may have been wrongfully removed from the UK as a result of the scandal.